Our English speaking guide-driver will meet you at the International airport of Zvartnots with signboard of your name and will pick you up to the hotel. Check into hotel in Yerevan. A short drive from Yerevan will lead you to Khor Virap Monastery, the most famous pilgrimage site of Armenia from where you may witness the stunning views of Mount Ararat. Discover of some mineral springs in Ararat region (Vedi). Way to Vayots Dzor region. Depending on time way to Noravank monastery – one of the most splendid monuments of medieval Armenia. Lunch near Areni. Continue discovering springs of the region (Yeghegnadzor, near Agarakadzor village). Way to Jermuk. Discovery of some springs of Jermuk. Way to Sisian. Visit of hot springs of Vorotan and Shamb. Continue to Satani kamurj with springs. There are 2 natural pools here! 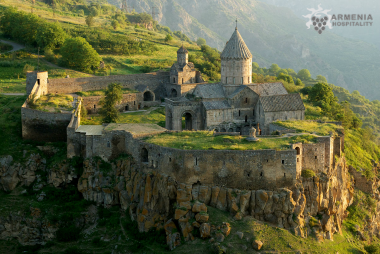 Depending on time visit also Tatev monastery – one of the largest and the most famous monasteries in Armenia. You can admire the Vorotan gorge through “Wings of Tatev” ropeway which is the world’s longest cable car (5752m). Way to Nagorno – Karabagh. Passport control on border! NO PHOTOS PLEASE! Then continue to Hak spring in Latchin corridor( Berdzor now). Late in the evening way to Stepanakert-the capital of Nagorno – Karabagh. Dinner and overnight in Stepanakert. Early in the morning way to Kelbajar valley with Zuar and Istisu springs. It’s strictly forbidden to take a bath here! The road condition is poor and some of the road is really off road! No need to hike here for the moment! Picnic lunch during the tour. There is no hotel near this walleyso you have to continue the road to lake Sevan. It is one of the largest freshwater high-altitude lakes in the world. 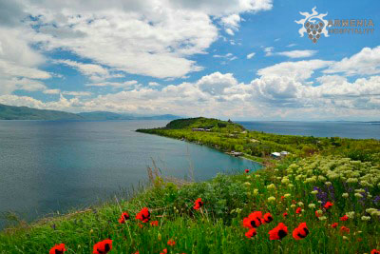 Lake Sevan is situated in the central part of the Republic of Armenia, in the Gegharkunik Province, at the altitude of 1,950 m (6,200 ft) above sea level. Dinner and overnight in Sevan. Way to Kotayk region. Depending on the availability of springs visit to some of them in this region- (Hanqavan, Tsaghkadzor, Bjni, Arzni, Arzakan) – Depending on time way to Garni Temple- the only surviving monument of the Hellenistic period in Armenia , Geghard Monastery-under UNESCO. Picnic lunch during the tour. Late in the evening back to Yerevan.